I love Seattle. I love its mild climate and somewhat distinct seasons (though three of them have a common denominator: rain). I love the different neighborhoods, each with their own individual character and charm. I like being able to venture into chaotic downtown or into the peaceful wooded parks depending on my mood. The panoramic views of majestic Mt. Rainer, the Olympics and the Cascades never fail to take my breath away, but the mountains aren’t the only sights that enamor me; the cherry trees in full bloom at UW, the view of the city lights reflecting off Lake Union from Gas Works Park, and the curving road through the lush Arboretum all get my heart racing. Having lived in Seattle for about two decades and then spending four years in Colorado, I have also come to realize some of the city’s faults. The drivers here are clueless, the summers are too short, and the people aren’t the friendliest in the world, but its home. I am (as you may have gathered) a Seattleite. Known as snobby, coffee-guzzling, North Face-wearing, flannel and Birkenstock-outfitted, health-food-obsessed, tree-hugging, granola munching, yuppie hipsters, Seattleites tend to get a bad rap. However, I will confirm my stereotypical Seattleite granola munching ways with the recipe I’m about to share with you: quinoa granola. That’s right, I’ve roasted, toasted, and coated those virtuous little protein-filled seeds with clover honey then mixed them with toasted almonds for a crunchy, lightly sweetened snack. Put on your flannel shirt and hipster glasses, pour a cup of fair trade coffee, turn up the Nirvana and dig into a bowl of this for breakfast and you’ll be a salivating Seattleite too. This granola is delicious over yogurt or fruit, with milk, or all by its lonesome. You could also use 2 ½ cups of plain, leftover cooked quinoa in this recipe. This isn’t very sweet granola, so you may want to increase the honey by 1-2 tablespoons if you like granola on the sweeter side, or use agave nectar if you want to make it vegan. You may also omit the almond extract if you don’t like it. Cook the quinoa. Bring the quinoa, water, and salt to a boil in a medium saucepan, then reduce the heat to low and cook for 15 minutes until the quinoa is cooked but still slightly chewy and the water has been absorbed. Spread the cooked quinoa out on a baking sheet to cool. Toast the almonds. 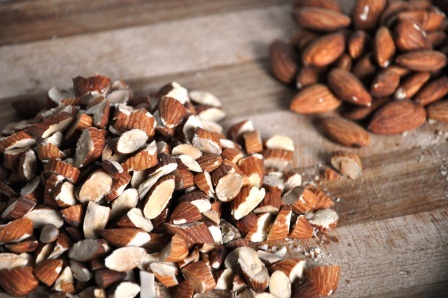 Preheat the oven to 350° F. Spread the almonds out on a baking sheet and toast them in the oven for 8-10 minutes until they are fragrant and light golden brown on the inside (cut one in half to check; if they aren’t ready, cook for another 1-2 minutes monitoring them carefully so they don’t burn). Cool the almonds on the pan, then coarsely chop and set aside. Make the granola. 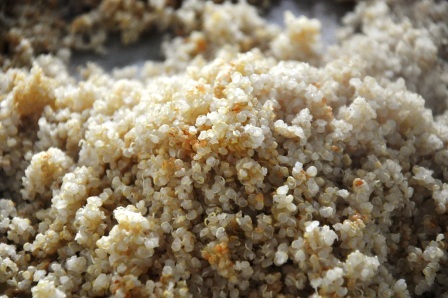 Toss the quinoa with the vegetable oil and spread out evenly on the baking sheet. 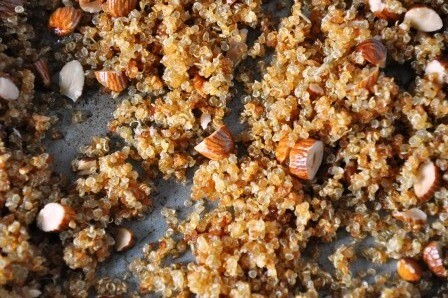 Bake the quinoa for 30 minutes, stirring half way through. 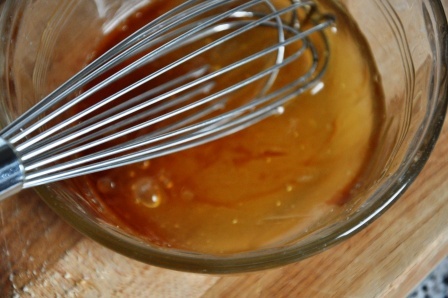 Heat the honey in a small saucepan until liquid (or cook for 30 seconds in a microwave). Pour the honey mixture over the quinoa and continue to cook for 30-45 minutes, stirring the mixture every 10 minutes or so until the granola is golden brown and crisp. 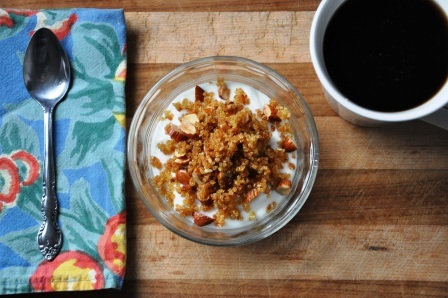 Mix in the toasted almonds and extracts, and then allow the granola to cool thoroughly. Keeps in an airtight container for 3-5 days.